A grid connected system is connected to a large independent grid (typically the public electricity grid) and feeds power into the grid. Grid connected systems vary in size from residential (2-10kWp) to solar power stations (up to 10s of GWp). This is a form of decentralized electricity generation. 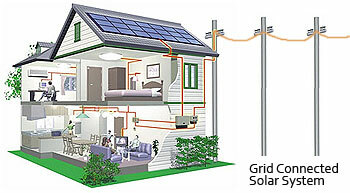 In the case of residential or building mounted grid connected PV systems, the electricity demand of the building is met by the PV system. Only the excess is fed into the grid when there is an excess. The feeding of electricity into the grid requires the transformation of DC into AC by a special, grid-controlled inverter. Grid-connected PV power offers consumers both economic and environmental advantages. Where utility power is available, consumers can use a grid-connected PV system to supply a portion of the power they need while using utility-generated power at night and on very cloudy days. While residential, grid-connected PV systems (10 kilowatts or less) can provide most of a home's electric needs, they may also generate more electricity than needed. The electricity generated by the PV system can be used on site or fed through a meter back into the utility grid. For example, if a PV system is generating at near its rated output and a system owner is on vacation or not home during the day, a system will typically be producing more electricity than is needed for a given time period and that excess can be "sold" back to the utility. At the end of the month, a credit for electricity sold is deducted from charges for electricity purchased. When a home or business requires more electricity than the grid-connected PV array is generating (for example, in the evening), the need is automatically met by utility power. A grid-connected PV system is connected to the utility system or grid through an interconnection agreement with your utility company. The interconnection agreement sets the terms and conditions under which a PV system can be safely connected to the grid and outlines metering arrangements (net metering) for your PV system. Vorks Energy is a MNRE, Govt. of India approved system integrator for Grid Connected and Off-Grid PV system installations.